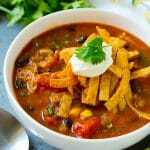 We eat a lot of soup during the winter, some of our favorites are stuffed pepper soup, cabbage roll soup, taco soup and this amazingly delicious enchilada soup. Chicken enchiladas are awesome, but let’s face it, they can be a lot of work. Between making the filling, the sauce, then rolling up all those tortillas, it can be an hours long affair. 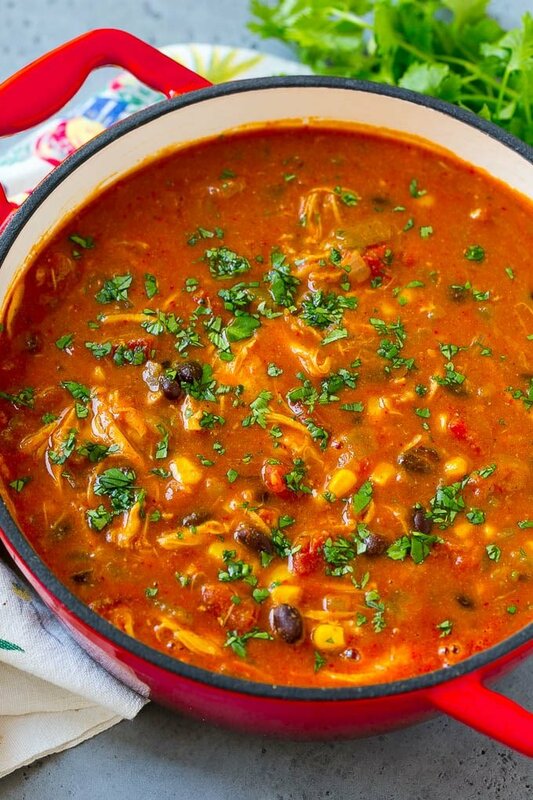 This chicken enchilada soup has all the same great flavors but with WAY less work. It’s a one pot meal that’s on the table in less than 30 minutes. 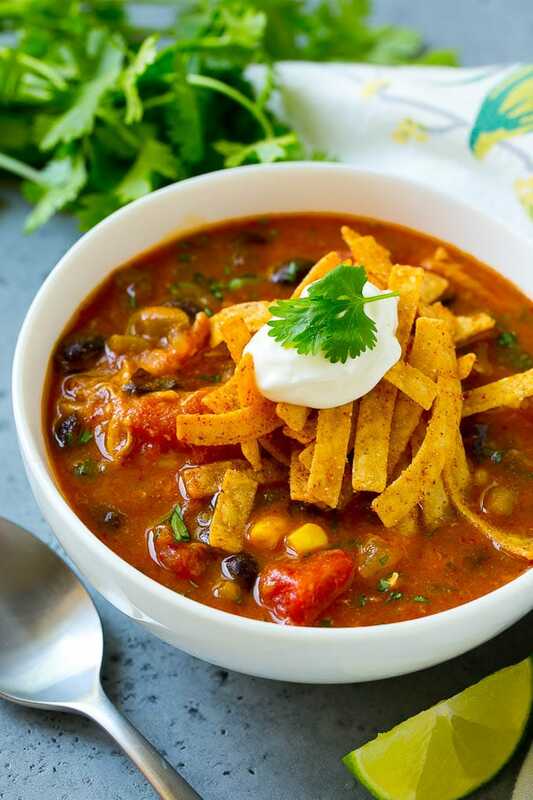 How do you make chicken enchilada soup? This soup starts with a saute of onions and garlic. The next ingredient is one you may not have heard of before, and it’s called masa harina which is a corn flour. It’s sold in my grocery store under the brand name Maseca in the baking aisle. 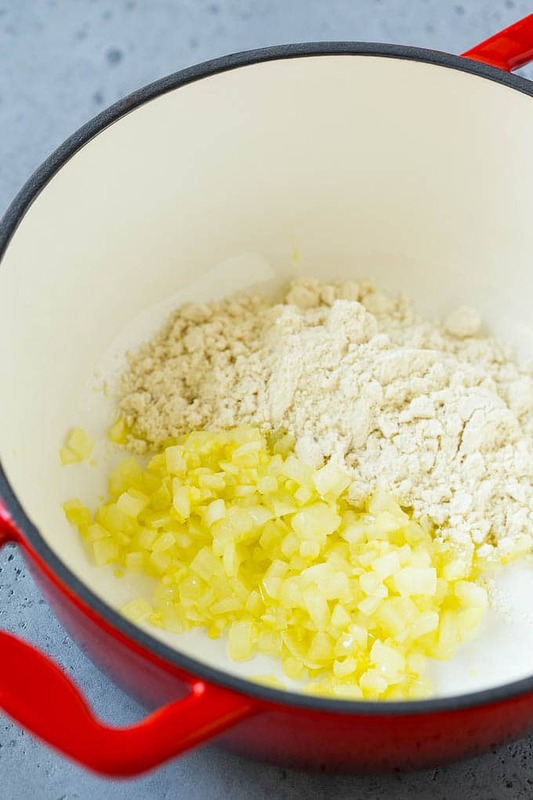 If you can’t find masa harina, you can omit it, but this corn flour really gives the soup an authentic flavor and helps to thicken up the broth. After the onions and masa harina are in the pot, the chicken, tomatoes, corn, black beans, green chiles, enchilada sauce and broth all follow. You can use any kind of cooked chicken for this soup, such as leftover cubed chicken, shredded rotisserie chicken, or roasted chicken. Not a fan of black beans? Try pinto beans instead. 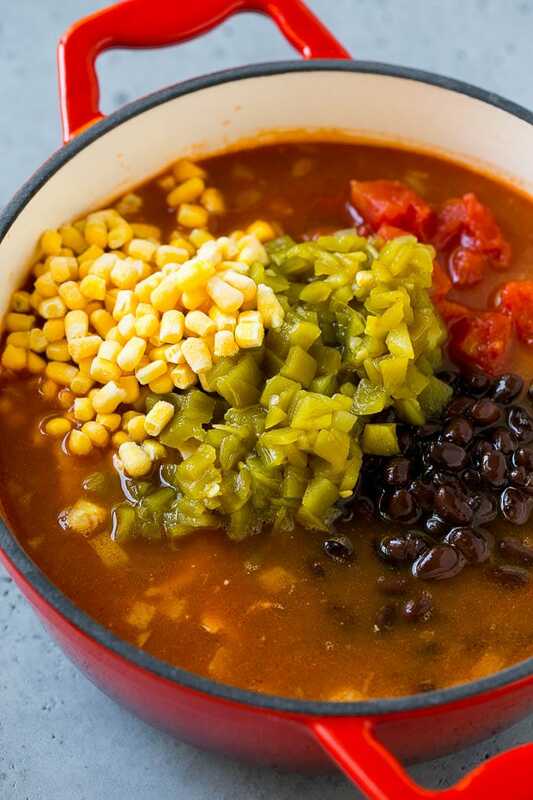 I use frozen corn, but canned or fresh corn will also work just fine. I chose a mild red enchilada sauce, but if you prefer spicy, use a hot enchilada sauce instead. 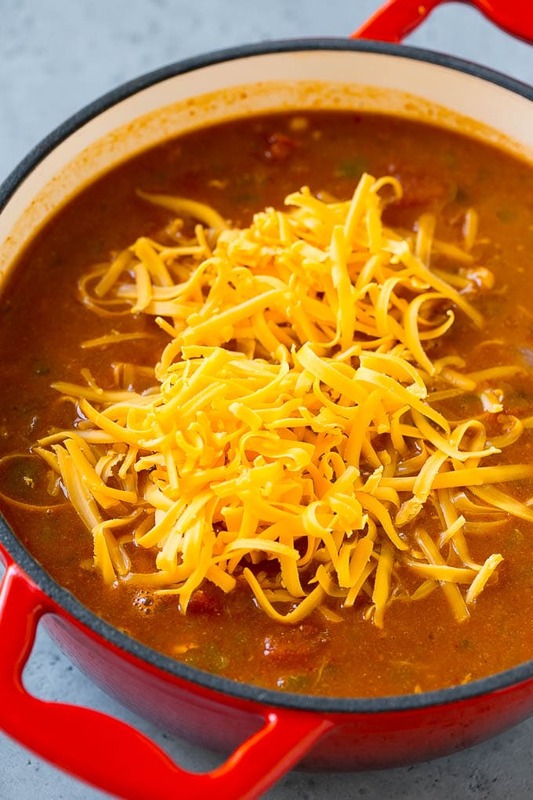 The final step to this chicken enchilada soup is to stir in some shredded cheese, which thickens the soup even more and gives it a rich and creamy flavor. You can make this soup in the slow cooker, but you’ll want to start with uncooked chicken breasts. Place the chicken breasts, along with the onion, beans, chiles, tomatoes, enchilada sauce, masa harina and broth in the crock pot. Cook for 3-4 hours on high or 6-8 hours on low. Shred the chicken with two forks, then return it to the soup. Stir in the cheese, top with cilantro, and serve. This soup is absolutely perfect for a cold day, it’s comfort food at its finest! I will definitely try this! I love Mexican dishes! Do you think I could do it without the cheese? I know what we’re having for dinner tonight! This sounds perfect for the cold winter day we’re having. I love making soups and this one looks delicious! I want to try making this. I’ve never been much of a soup fan for some reason, but I know some family members would love this recipe. It’d be perfect for this time of year. Wow, that looks like a yummy treat for my boys. I checked the ingredients and most are not in our pantry. I have to visit the local store and get some ingredients. This sounds like such a flavourful soup and perfect for cold winter nights. My whole family would definitely enjoy this soup. Good description, and easy to follow procedure. I believe this is something I can try, though am not a chef. Thanks. You’ve included all my favourite things in one pot! I love this for winter too, it’s so warming! 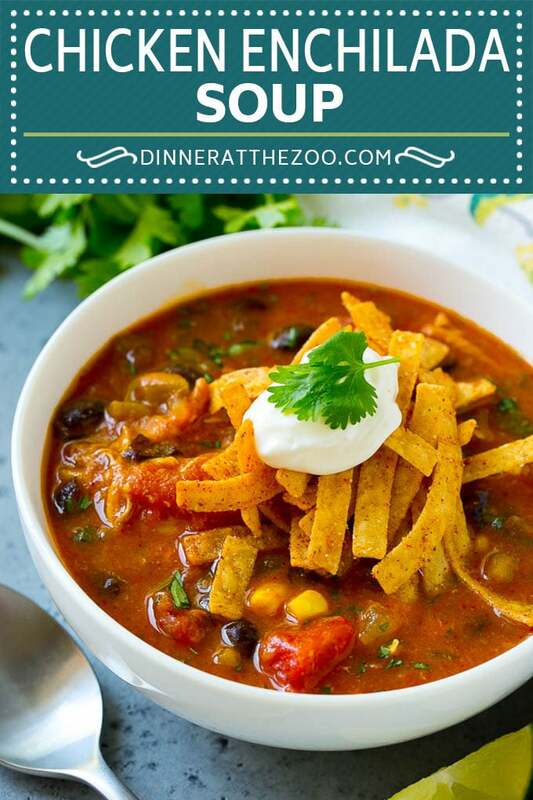 Adding avocado into chicken enchilada soup is one of my favorite things to do! This is a great recipe I will definitely try! Times like this that I wish I still ate meat. This looks SOO good. Do you think I could make it minus the chicken? wow another amazing idea! I can`t get enough of your ideas and I really think that you are an amazing chef! Did you think about having a youtube channel as well? I actually don’t have a youtube channel at this time but I do have tons of cooking videos on my facebook page! I love soup even it is not winter time, drinking soup is kind of a must for us, especially those Chinese from the southern part, where my grandparents are from. I like how this soup recipe is loaded with a healthy ingredients such as shredded chicken and beans, all are full of protein. And not forgetting the vegetable too!